hanalei and austin were in town from SF this weekend and we didnt know if we’d get to see each other, but we switched around our schedule to meet up with them to go climbing in provo on saturday night. we’ve been climbing with them in the winter at the quarry climbing gym, and ever since then we’ve been talking about outdoor climbing together…but then they moved away! all of our climbing friends moved out of state and we never reached our full climbing potential! but the genes hooked us up with all the gear we needed. david loves climbing up random rock formations everywhere we go, so naturally he loved it. and im not too afraid of heights so i did pretty good, as long as i didn’t psych myself out for TOO long by thinking, “seriously, THERE IS NOOOO WHERE TO PUT MY FOOT right now! !” luckily austin was a patient, good teacher. now that our other climber friends tanner and brynne are living in SLC again, we’re ready for another trip! what do you say brynne? i think baby morris is ready. 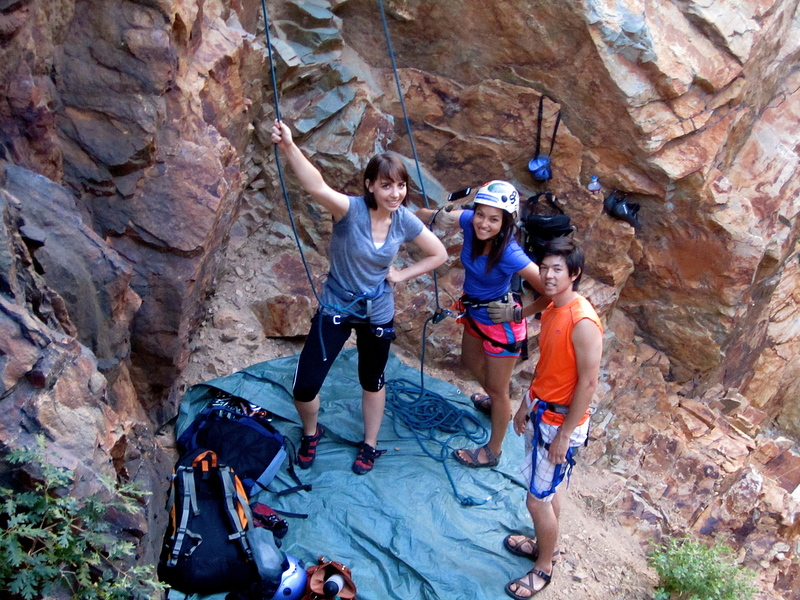 This entry was posted in nature and tagged climbing, rock canyon, the genes. Bookmark the permalink. cute pictures~ but it sccccares me just a bit! that’s wayyy up there! haaaha that is really the very reason i freak out toooo! along with being up high and not knowing where to put my foot but whateva. i’m totally proud of you and those pics are so pretty! morris and i still would like to hear all about it asap (mostly so we can hang with you) and we will try to be as great of climbing friends as hanalei and austin but that’s pretty stiff competition but we’re up for the challenge! yes i would love to tell you about it in person!! i have friday off and we should hang out. Let’s not wait a whole year again until we get to climb together next! I’d love to climb with Brynne too. Ps you both did amazing for first timers!